Description: Sexes similar. 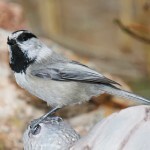 Gray above; pale below; black cap and bib; and white cheeks. 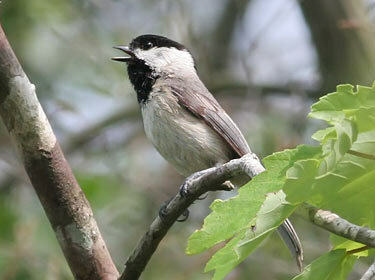 Lacks broad white edgings on wing coverts, and the lower edge of black bib is usually neater than Black-capped Chickadee’s. Best distinguished by song. 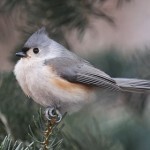 Habitat: Open deciduous forests, woodland clearings and edges, and suburban areas. Forages in trees and thickets, and seldom descends to the ground to feed. Where in Nebraska: Accidental. Specimens captured in Fontenelle Forest, Sarpy County in 1974, after being first heard there in 1969. 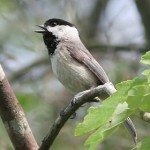 Fun Facts: Carolina Chickadees can hybridize with Black-capped Chickadees and their offspring can sing either song of the parents or something in between.